BEST PCB repair kits and materials give you the tools you need for fast repair and modification of lands, traces, contact fingers, SMT pads, plated hole connections and PCB base board material can be repaired using BEST PCB repair kits and materials. These materials, packaged together and designed by one of the premier PCB repair companies, BEST Inc., allow you to meet original PCB quality standards. In addition to our all inclusive PCB repair kit we have several specific PCB repair kits. These are the most complete PCB repair kits and repair materials for your printed circuit board repair needs and includes not only the material required for such repairs but also professional "how to" instructional videos. It's the total package. Each different PCB repair kit includes a selection of the materials you will need to make a certain repairs whether that is through-hole, laminate, trace, pad or epoxy. 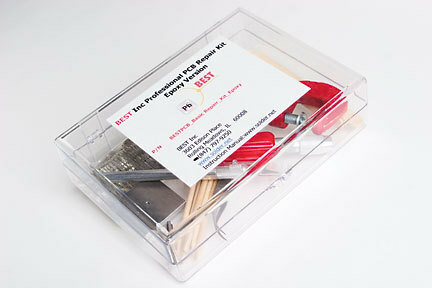 Each PCB repair kit also contains a variety of specialty tools which, are used by both BEST Inc professional repair technicians and as teaching aids for board level repair instructors. If you need to repair damaged circuit boards and do not require the kit then we have a wide range of repair materials that you can buy singly. We support our products. Check out our instructional vides and our instructions. If you are having trouble witha repair technique we can support you via a call, picture or video. If you still cannot get the repair we can talk to you live about your PCB repair requirement. Finally, BEST can also provide you the PCB repair service by having you send us the board in order for us to repair the item.